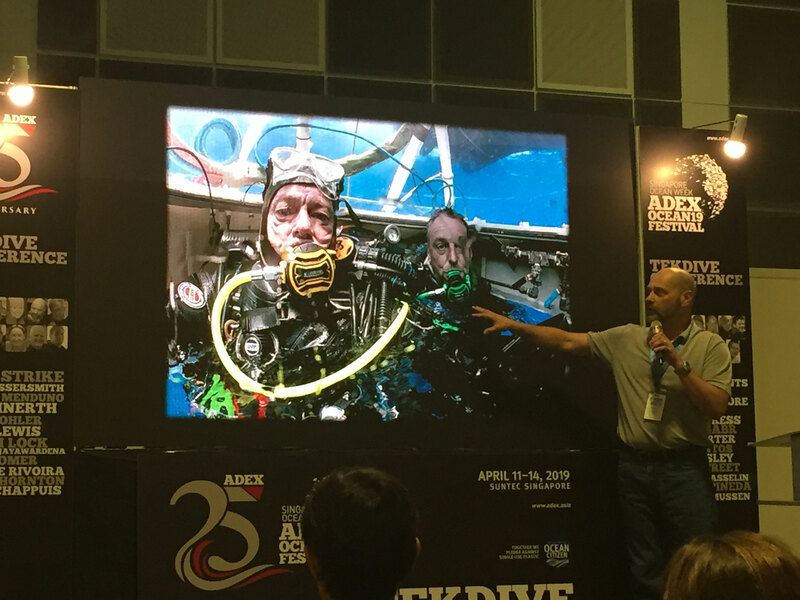 ADEX Singapore 2019 at Suntec City Convention and Exhibition Hall kicked off with a bang to mainstream visitors on 12 April 2019 morning as some of the biggest names in technical diving such as former AquaCorps founder and editor, Michael Menduno, David Strike, the recipient of the ADEX “Lifetime Achievement Award” for his contributions to technical diving, and Ritchie Kohler, technical wreck diver, shipwreck historian and host of the documentary television series Deep Sea Detectives, took to the stage at the ADEX Tek Dive Conference to share their knowledge with ADEX attendees. With a background in military, commercial, recreational and technical diving, David Strike served in the United Kingdom Royal Navy, during which he participated in a ground-breaking oceanographic research project. 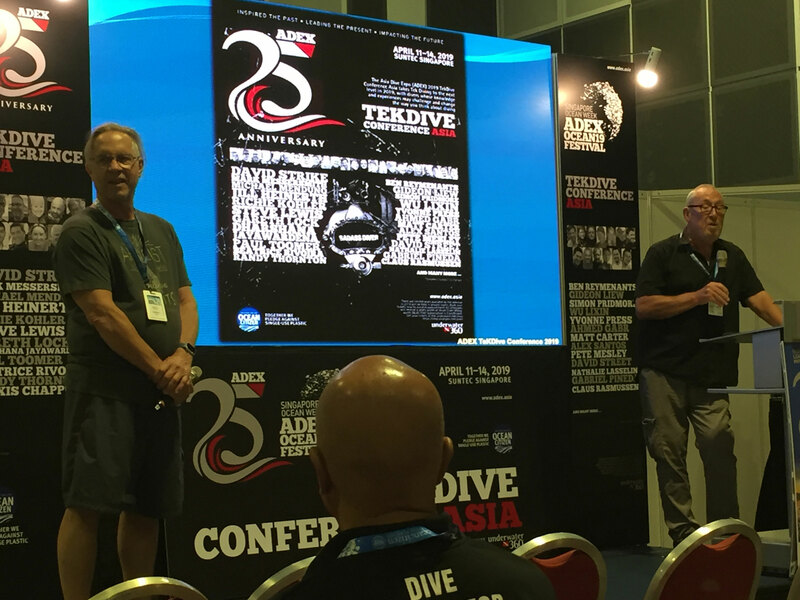 Joined onstage by Michael Menduno, who founded AquaCorps magazine and was the first person to coin the term “technical diving”, Meduno and Strike proceeded to talk about the humble beginnings of technical diving and how it has evolved from a little known fringe sport to being the vanguard of diving exploration. Next up was Beatrice Rivoira from Italy. An active technical instructor on both open circuit and close circuit rebreather, Beatrice has a Master’s Degree in Marine Biology and Oceanography and does biological studies on deep wrecks. 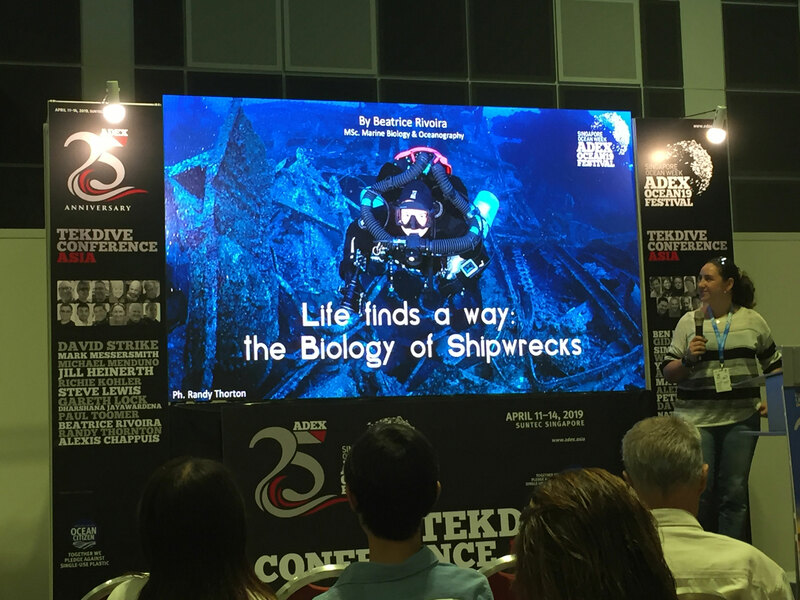 In her talk, Beatrice shared with the audience how the public’s perception of what is a deep shipwreck has changed over the years along with the improvement in tech diving technology from 30 metres to 40, 70 and more than a 100 metres, even though technical diving is dangerous at all depths. She shared that for marine biologists, going into a deeper environment , biological coverage at different depths is different. An experienced tech wreck diver and a shipwreck historian, Ritchie Kohler stepped up to the stage next to introduce himself to the audience but was beaten to the punch by Michael Menduno’s teasing introduction of him as an “old shipwreck diver”. Laughing at his buddy’s good-natured ribbing, Ritchie continued with his introduction, revealing that he had been sharing stories on ship wrecks for the last 20 years on television, adding that “it’s the ability to share that passion for diving” that drives him. As one of the co-hosts of History Channell’s Deep Sea Detectives, Kohler regaled the crowd with insider stories of his shipwreck dive exploits, including his exploration of the sunken Britannic, the sister ship to the Titanic. First featured in The Jacques Costeau Odyssey: Calypso’s Search for Britannic, Kohler showed the conference interior underwater pics of the Triton submersible he rode to explore the Britannic before introducing Dimitri, the pilot of the Triton as well as pics of the Diving Bell that was also used for shooting the Britannic. Kohler ended the talk by showing the audience a sneak preview of his new documentary series, Dark Waters, which has already been sold in the United States and will be coming to Asia soon. The concept of bringing a hundred years of maritime history to life by recreating the past with character actors and sets is an exciting concept that brought thunderous cheers from the audience. By bringing heroes, villains and victims off maritime history to life, audiences get to live in the exciting moment of history. Ritchie Kohler showed audiences snippets of his new television documentary series, "Dark Waters". Chaired by Chloe Harvey of Reef-World Foundation (Green Fins international coordinators), co-organised by UW360 and supported by Blue Ocean Network, this Sustainable Think Tank conference featured a gathering of pro-active dive industry leaders to share intel on how to pursue a sustainable business model. Chloe elicited knowledge sharing from the industry leaders in attendance as they shared their experiences and lessons in how they improved access to environmentally friendly products like reef safe sunscreen, and environmentally friendly cleaning products and shampoos. Lembeh Resort, a luxury dive resort in the Lembeh Straits in Indonesia shared with conference participants about their alliance with mainland partners in pooling their resources to lower prices for green products through bulk purchases. 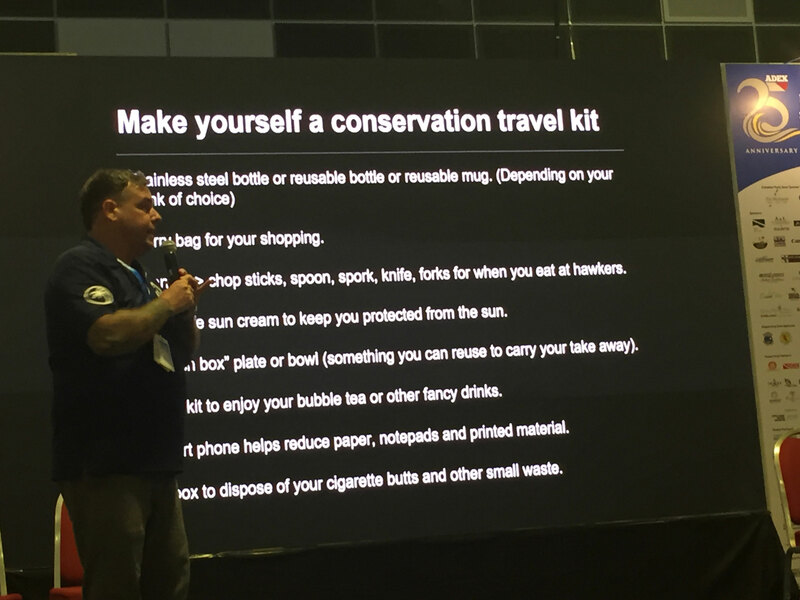 SuSan Stephanie, from the Diver Operator Community Komodo (DOCK) also shared with the think tank their eco travel kit for tourists. Sold to tourists in reusable bags, these eco travel kits help fund the waste management and environmental awareness programmes run by DOCK. Beside this knowledge sharing, the think tank also broke into small groups to discuss examples of sustainability projects launched by group member companies, the challenges encountered and the support given or needed. The Book festival at ADEX also saw plenty of renowned underwater photographers talking about their latest exciting work, such as the Legend Beneath the Waves Philippines by Andrew Marriott, Silent Kiingdom by Christian Vizl, Face to Face: Up Close with Mother Nature by Al Hornsby , Elysium: Heart of the Coral Triangle by Michael Aw, Dinner with Divers by David Strike and Simon Pridmore and Black is the New Blue (Second Edition) by Scott Tuason, Ace Wu, Jade Hoksbergen, Henley Spiers and Ram Yoro. There was also the inaugural Future Forward Panel on Innovation moderated by Diving Industry Pro Consulting CEO, Ronny Roskoosch with a panel consisting of product inventors/company founders and diving agencies including: Jean-Cluade Monachon (SSI), John Seddon (Scubapro), Sandro Lonardi (PADI Travel), Harold Hordosch (Seacam), Pete Ceglinski (Seabin), Louise Hardman (Plastic Collective), Brad Chen (Crest Diving), Cyril Castello (Jellyfishbot). The panel raised many salient points on how innovation and training advancement can work hand-in-hand in advancing the advancement of the industry and the increased protection of the ocean and its inhabitants. Pete Ceglinski, the founder and creator of Seabin was also on hand to give a talk on how Seabin is revolutionalising the cleaning up of the oceans by sucking up rubbish in the ocean. 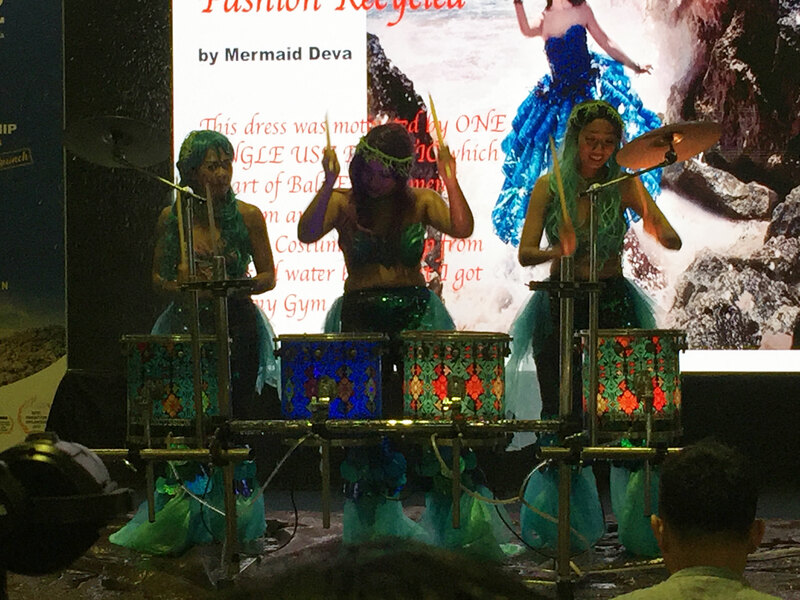 After lunch, the exciting festivities at the main stage of ADEX reached its climax as the water drums trio of Orange Productions led by mermaid Deva Harris hyped out the crowd in a cacophony of latin rhythms outdone only by the coloured splashes of water spritzing into the air with every beat of their drum sticks. 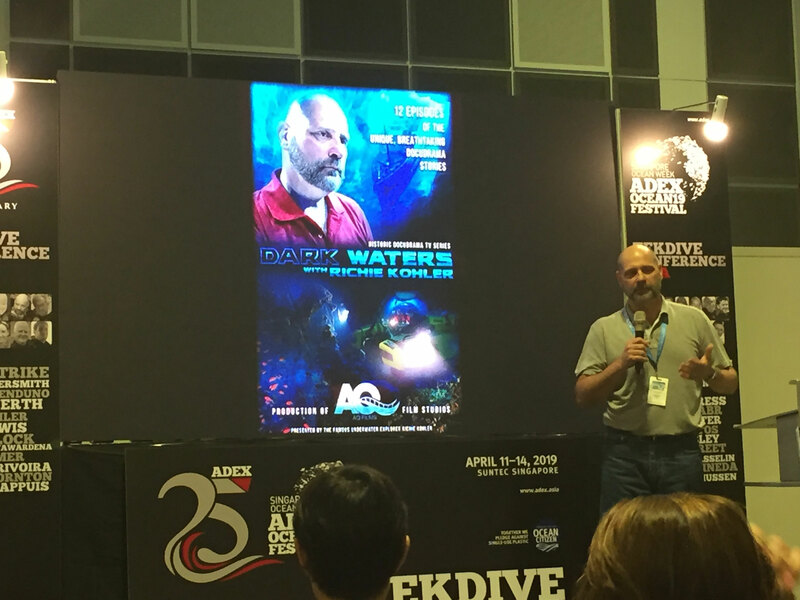 After the performance, the crowd was treated to a touching look back at the early beginnings of ADEX as the founders of ADEX, Rainer Sigel and Chris Sweeting spoke about the early days of ADEX while David Strike and Mike Menduno also touched on ADEX being the first in Asia to promote widely the advent of tech diving 25 years ago. The other essential men responsible for the past success of ADEX such as former ADEX CEO, Herman Ho and Clement Lee, formerly from the Sabah Tourism Board both gave touching testimonies to the progress of ADEX over the years. Asian Geographic Magazines Pte Ltd and ADEX Singapore CEO John Thet also gave a speech thanking his predecessors, his team and the commitment of ADEX towards the ocean with the setting up of Ocean Citizen to unite all comers towards the protection of our oceans. His speech was followed by an address by the High Commissioner of Canada, Her Excellency Lady McDonald, who spoke on the three issues Canada has recently committed to. The first is the oceans plastic charter against single-use plastics at the G7 meeting lasty ear. The second was the contribution of an art piece by Canadian artists to Singapore’s year of zero waste at the Sustainable Singapore Gallery. The third was the introduction of Canadian technology companies who have taken up the fight against plastic pollution through innovation. 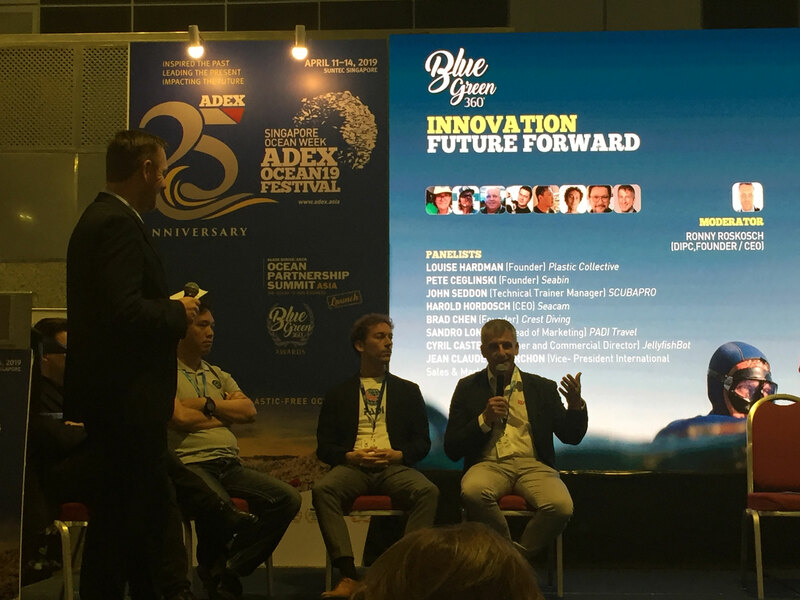 Bruce Dudley, Senior Vice President of Globe Series, then took to the stage to announce the Ocean Partnership Summit, which will be co-organised by ADEX next year in conjunction with ADEX 2020. A government-to-government summit dedicated to combating plastic pollution in the ocean, the Ocean Partnership Summit marks a new chapter in the development of ADEX to a dive show that now engages on a policy level with governments worldwide. With more than 17,000 islands, Indonesia is the Official Country Partner of ADEX 2019. To commemorate the official opening of ADEX, ADEX is proud to have ADEX Singapore 2019 Guest-of-Honour Ms Rizki Handayani, Deputy Minister of the Ministry of Tourism, Republic of Indonesia, speak at the official opening of ADEX 2019 as all attendees listened intently to Indonesia’s commitment to a plastic-free ocean. Thirach Rungruangkanokkul, Executive Director of AFMA (Agricultural and Food Marketing Association for Asia and the Pacific) – the inter-government non-profit organization in association with Food and Agriculture Organization (FAO) of the United Nations, also specially flew in to appoint ADEX as the Sustainable Ocean Ambassador. An environmentalist in Malaysia, HRH Princess Zatashah Idris W also took to the stage at ADEX to speak about combating plastic pollution in Malaysia.